Have you ever tuned in to Andrew Bolt’s televised hate fest on Sky News? I personally can barely bring myself to watch even a few minutes for research purposes, let alone choose to give up precious blocks of my time to be insulted and rebuked and spat upon by Bolt and his parade of useful idiots. However, a few days ago, I did watch a few minutes of Bolt and his useful idiot du jour, One Nation leader and Senator, Pauline Hanson. I’m sure you’ve probably seen the clip too. It’s the one where Hanson displays her idiot qualities in all of their splendid ignorance. You can watch the clip on the News.com website. But, seriously why would you choose to do that? Instead, just read this transcript, provided by the wonderful folk at Pedestrian TV. Thankfully, sensible people responded with their usual civility and good humour and actually provided a history lesson to Hanson via social media using the hashtag #defineaboriginal. For a start, the noun form is Aborigine, but Hanson’s ignorance knows no bounds. The whole rant from Hanson started with her hare-brained comments on freedom of speech and lasted around two minutes. It was hateful and spiteful and nasty and it reminded me of this. This is precisely the emotional effect that Bolt is trying to achieve, day in and day out. His program is no more than a collection of such two-minute noodles. Luckily for Bolt, Pauline Hanson is easily wound-up and she’s guaranteed to voice the darkest fears that hate thrives on. Her appearance in July this year is another classic in the genre. This time Hanson is the foil for a Bolt rant about Muslims and the Human Rights Commissioner, ‘Whatshisname’. Hanson then directs the hate towards “gutless politicians” as well as the bloody Muslims. In a rambling and almost pointless column in The Australian on 2 November: THE MIND CODDLES, ultra-conservative Murdoch calumnist Janet Albrechtsen lamented the rise of so-called ‘political correctness’ on American university campuses and she cited an increase in administrative attempts to impose ‘trigger warnings’ on the content of some course materials to prove her point. Albrechtsen tapped into the NewsCorpse hive mind in preparing this article. In the first instance, she borrowed the idea from an October 10th column by the Herald Sun’s Rita Panahi, whose intemperate language and abusive tone goes unchecked by her editors. Albrechtsen also returned to the ‘yoga pants man’ imbroglio that we discussed in last week’s Media Sauce. Then, a few days after the Albrechtsen column, ‘emeritus’ (simply means unpaid) Professor John Carroll returned to the theme in an opinion piece about the evils of Section 18C of the Human Rights Act: ‘Anguish is exquisite for wielders of 18C’. I’ve already been down the 18C rabbit hole and will go there again later this week, but for now I want to introduce you to the News Corp methods of groupthink and pushing inconvenient facts down the memory hole. 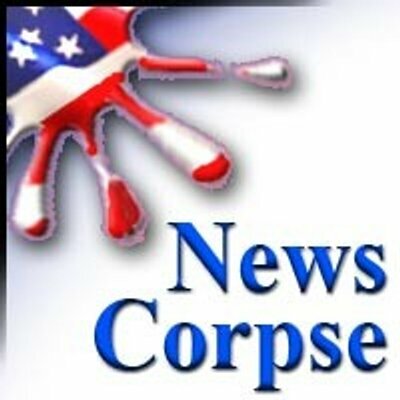 Groupthink is easy; it is represented clearly in the way that News Corp editorial and political lines are set at a high level and then all news and opinion reproduces the lines day after day. The current and increasingly vicious campaign against the Human Rights Commission and Section 18C of the anti-discrimination legislation is a paradigm example. I have written extensively on this phenomenon over on my blog, Ethical Martini. The simple point about the memory hole is that it permits the perpetrators of groupthink to deny that they do it, through the simple act of forgetting. So firstly, permit me a short diversion into George Orwell’s magnificent novel of dystopian state capitalism, Nineteen Eighty-four. Ah, so the new year starts as the last one ended with a fact-free front-page EXCLUSIVE, but this time, the culprit is not The Australian, but its sister paper, the Herald Sun published in Melbourne. 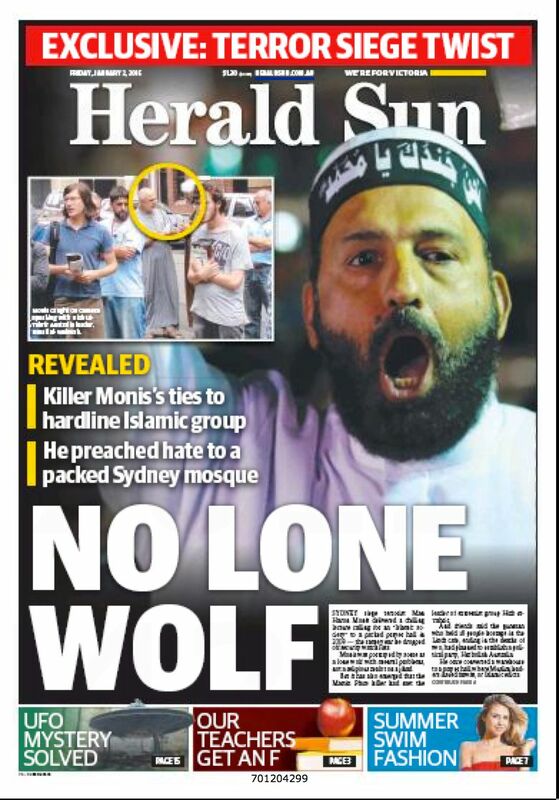 According to today’s front-page splash “EXCLUSIVE TERROR SIEGE TWIST”, the Hun makes the bold claim that Sydney siege killer Man Haron Monis is “NO LONE WOLF“. Sydney siege terrorist Man Haron Monis delivered a chilling lecture calling for an “Islamic society” to a packed prayer hall in 2009 — the same year he dropped off security watch lists. Did you catch the date? It was five or six years ago, give or take a New Year holiday. And, wow, a Muslim who believes in an “Islamic society”; I bet there are not more than, Oh, I don’t know, let’s guess 1.6 billion people who might fit that description. But, hey, Muslims; they’re dangerous, right? 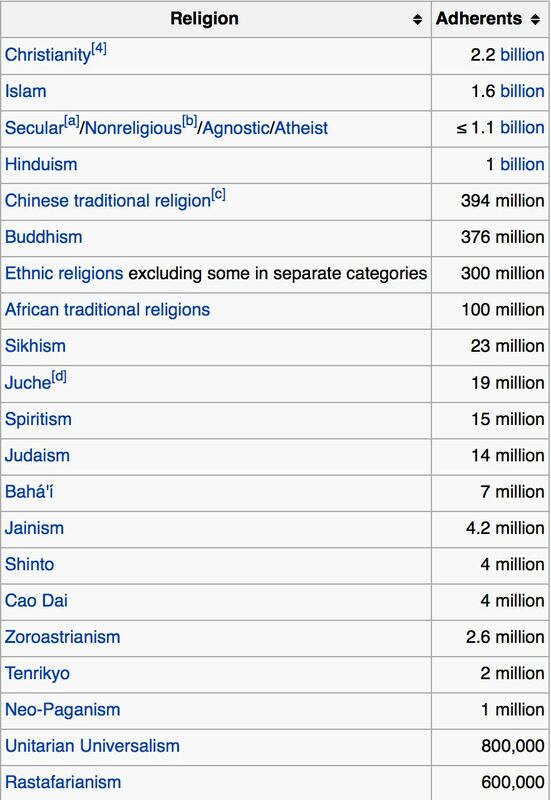 Yes, they are; not like the world’s estimated 2.2 billion Christians who go to church every week and listen to crazed men in long frocks calling for a “Christian society”. 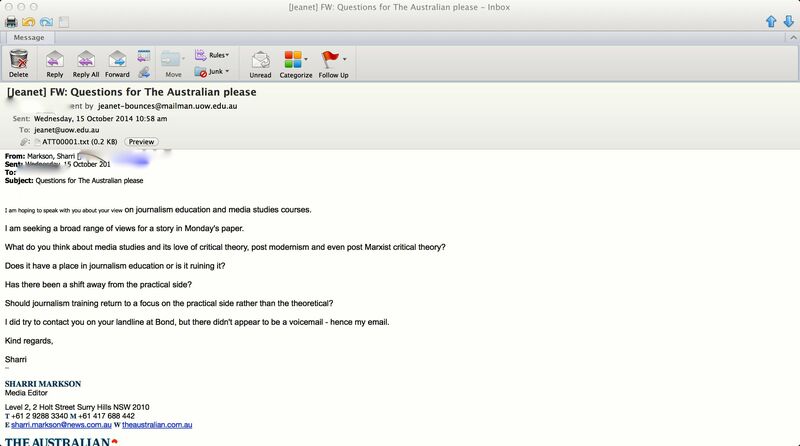 Apparently she’s planning a follow-up and today emailed a selected number of journalism academics and others to seek their views about journalism education. Sharri Markson’s email. Oops, it leaked. 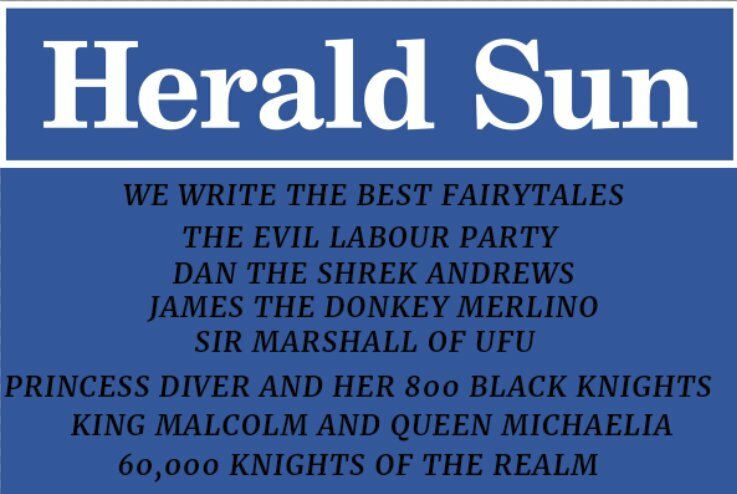 Our correspondent, Martin Hirst, was not on the list even though he’s been a journalism academic for 20 years and is a well-known critic of News Corporation. However, in to ensure Ms Markson gets the widest possible cross-section of views he sent her the following email. Dr Hirst is not confident that his views will make it into Monday’s Australian, so in the interests of transparency he’s agreed to share them with us. Thanks for your interest in a wide range of views about journalism education in Australia. I realise you have not actually requested my views, but I thought I’d share them with you anyway in the interests of ensuring that you do indeed get a wide range of views. BTW: I did tweet a question at you a couple of days ago about your consideration of the MEAA Code of Ethics in your undercover story.You were busy and might have missed it; please consider sending me an answer. What do you think about media studies and its love of critical theory, post modernism and even post Marxist critical theory? MH: There is actually a broad range of theoretical approaches in media studies, not all of them revolve around critical theory, post modernism or post Marxist critical theory and of course, media studies and journalism studies are distinct disciplines that do have some overlaps. Many journalism programs also operate alongside PR and other communication disciplines and we encourage students to take courses in these subjects as well. We also encourage them to take studies in non-communication disciplines in history, politics, psychology, sociology etc, even sports science in some places. We do this because – like you — we value the breadth of knowledge and we know that the news industry needs people with some content expertise, not just a ‘journalism only’ degree. Views among journalism educators in Australia range right across the theoretical spectrum from highly normative approaches that continue to value objectivity and fourth estate theories of the press; there are even libertarians among us and then there’s those of us who think that critical theory is useful (careful how you define “critical theory” it has a 100 year history and many variations). For instance: do you mean Habermas theory of the bourgeois public sphere or McChesney’s approach to media regulation in America, or British cultural studies; do you mean Frederick Jameson’s postmodernity, or David Harvey’s “condition of postmodernity” or Zygmunt Bauman’s “liquid modernity”? Postmodernism and cultural studies are not overly influential in journalism education, the “media wars” of the 1990s were the highpoint of postmodernism in media theory and since then things have actually changed. If you check out the websites of the various journalism courses in Australia you will see that there is a great deal of variety in approaches taken. Some of us are indeed critical theorists and even Marxists (though out of the 100+ who teach journalism in the higher ed system I think you could count them all on one hand). I am really the only one who frequently puts up a hand to say “Yes, I’m a Marxist.” I am in a tiny minority. I am pretty sure that Wendy, Jenna, Margaret, Matthew and Penny (along with just about all of the JERAA’s membership) would tell you that they are explicitly not Marxists. Chomsky’s not even a Marxist. The approach that some of us use — among others — is what you might call a “political economy” approach (it is not the same as Marxism, though it is a materialist worldview) and it involves an examination of economics and social relations; in other words an examination of historical reality, similar in many ways to the methods of journalism. Political economy examines the news industry and the practices of journalism from a grounded position of asking “what is going on in the world and how do we explain it?” Again, you would be familiar with this approach from journalism – it is what journalists also do; ask questions, seek verification and try to approximate the truth using several sources and methods of triangulation. Political economy is also related to sociology – my PhD is in this field and so too are those of many other journalism academics. At the same time I also use the work of an American academic (now deceased) called John C. Merrill. Merrill is interesting in many ways — he has written extensively on the “dialectic” in journalism — as he see’s it the struggle between “freedom” and “responsibility” and how journalists cope with that. Dialectics is not a purely Marxist concept, it goes all the way back to Heraclitus and the idea of “flux”, you would know this as “nobody steps into the same river twice”. Merrill was a very conservative libertarian and thus would actually share some political opinions with your ultimate boss, Mr Murdoch. He would also probably be a member of the IPA today. So you can see, despite my Marxism, I am not sectarian. On the other hand, to balance this out, quite a few journalism educators are not very theoretical at all and would rather teach the inverted pyramid than critical theory. Where you might find consensus among us is that a balance of theory and practice is important; most would also say practice should probably outweigh theory in a journalism course and in most of them it does. Does it [critical theory] have a place in journalism education or is it ruining it? Of course critical theory (of many stripes) and other theoretical approaches have a place in journalism education and, far from ruining it, actually improve it. I have been involved in journalism education since 1993 and I think it has got better in that time because those of us who came into teaching straight from the newsroom (and if you care to check that is just about everyone of us who is teaching journalism today, despite your newspaper’s constant dismissal of this fact without checking) have gained qualifications in teaching (for example I have a Grad Cert in adult education) and also have postgrad qualifications (I gained my MA in Australian Studies while working as a daily journalist and my PhD while working as a lecturer). Theory and practice go together and in a professional course of study, consider nursing for example – as journalism in a university setting is — it is vital that both be central to the curriculum. As academics we are obliged to consider theory and practice, it is the role of a university to do both and challenging orthodoxy is part of that. We challenge the orthodoxy of thinking within the journalism and news business as well. One orthodoxy that we challenge is the perception fostered by your newspaper (among others, but mainly you) is the whole “those who can do/those who can’t teach” dichotomy that is constantly thrown at us like rotten fruit. It is a false proposition and no more than populist nonsense, so why do you continue to spout it? Is it because it suits your ideological agenda, because it is not supported by the facts? We (journalism educators) are not “failed” journalists as your editor continues to shout about. Has there been a shift away from the practical side? No, there has not been a shift away from the practical side of journalism in our courses. Practical and applied journalism are central to the journalism education project and embedded deeply in our curricula. There is, of course, variation between schools, but in general all of us take great pride in being practical. If you look at unit and subject offerings across the country you will see a strong emphasis on “learning by doing” which is a key pedagogy in journalism education. Nearly all of us run online publishing outlets for student work (I am doing a research project on this at the moment and looking at the application of what the Americans call a “teaching hospital” approach to journalism education; you are welcome to contact me to talk about this). My own pedagogy — which I’ve used very successfully for 20 years — is “the classroom is a newsroom / the newsroom is a classroom”. This is simple really – we simulate the newsroom environment in our classrooms to teach the practical aspects of journalism — students do a range of tasks from compiling stories as in-class exercises from materials we give them (e.g. Media releases, etc) which would be a common first-year approach; then in more advanced units in second and third year students would be given real assignments; i.e.. “Get out of the classroom and find a real story to cover”. We teach interviewing, research skills, how to do an FOI, how to keep contact books, writing the inverted pyramid, writing features, writing for online, audio and video editing, radio presentation and even on-air broadcast techniques for television. There are hundreds of examples up and down the country of journalism students writing of the student press or their local paper, running community radio stations, doing current affairs programs for community TV, and having their own online outlets. Then of course there’s the internships and work experience at all the major news companies across the nation and some of the newer start-ups too. So it is wrong to say that there’s been a shift away from the practical side. However, we do have a strong emphasis on law and ethics and you might argue this is theory, but it is equally about practice – we teach this through case studies and visits to actual courtrooms too. Should journalism training return to a focus on the practical side rather than the theoretical? There is no conflict here Sharri, see previous answer. In my view we get it about right, there’s always room for improvement and there is change constantly. Like the news business itself, we both (journalists and journalism educators) have to adapt to change because it’s right in front of us. I hope you find my comments useful; I’d be happy to talk if you want to clarify anything. You can look up my publications list from here. And you will notice I’ve actually written a couple of very practical textbooks among journal articles etc that you might dismiss as “critical” or even “Marxist” theory.